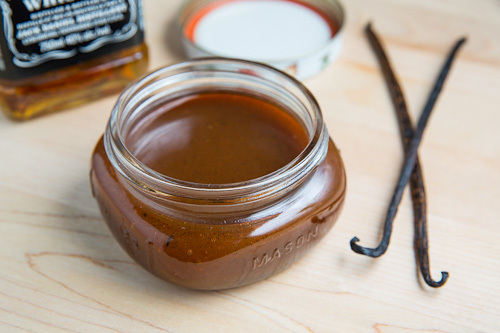 A creamy vanilla caramel sauce with a hint of bourbon. I almost forgot to share the vanilla bourbon caramel sauce recipe that I mentioned in the pumpkin Greek yogurt banana bread the other day! 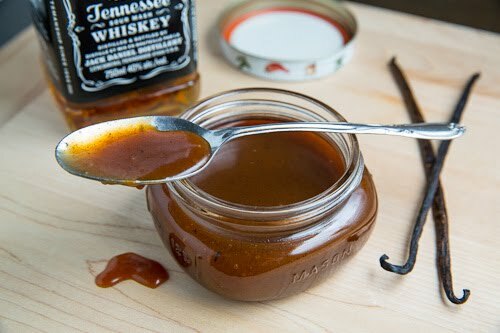 This vanilla bourbon caramel sauce is a pretty standard caramel sauce with the seeds from a vanilla bean and a splash of bourbon added to add a depth of flavour and to give it an even more amazing aroma. Caramel sauce can be a bit tricky to make at first but once you get the hang of it, it is really easy! In fact the hardest thing about it is that it requires you to watch it the whole time because if you take yours eyes of of it for a few seconds it can burn really quickly. So other than having to dedicate 20-30 minutes of time to making it, it as simple as melting some sugar, bringing it to a boil and cooking it until it turns a nice amber colour. All that remains is to carefully add the cream followed by the butter and any flavourings that you want, in this case the vanilla and the bourbon. Just look at all of those amazing flecks of vanilla bean seeds in there! Mix the sugar and water in a small sauce pan and let simmer over medium heat until a medium amber colour, about 15-20 minutes. Reduce the heat to medium-low, carefully pour in the heavy cream and stir until smooth. Mix in the butter, vanilla bean seeds and bourbon and stir until the butter has melted and combined. You DO know that Jack Daniels is not bourbon, I hope. I have to echo the previous comment…Jack Daniels is not bourbon. All bourbon is whiskey, but not all whiskey is bourbon. I saw the picture and came only to find 2 people had already pointed out my concern. Jack Daniels is a sour mash whiskey, bourbon has to be made from at least 51% corn. Perfect poured over ice cream! Not to get into a semantic debate about nothing, but Jack Daniel's is Tennessee Whiskey. Legal definition of Tennessee Whiskey: "a straight Bourbon Whiskey authorized to be produced only in the State of Tennessee". So yes, all Bourbon is Whiskey, and all Tennessee Whiskey is Bourbon. Does the alcohol cook out of this? Safe for preggos or no? Anonymous: You cna simmer the caramel sauce for a few extra minutes after adding the bourbn to make sure that the alcohol is cooked off. Enjoy! Now I know what to give my sister for Christmas… I know she would LOVE a jar (or two or three) of this. Nope, not all Tennessee whiskey is bourbon. This isn't a semantic argument, it is defined legally by the U.S. Gov't. (Which definition also holds in Canada per agreements about imports and labeling). Could I substitute vanilla bean paste for the actual vanilla bean scrapped? If so do I need to alter anything else? This looks amazing! I've been on this kick of making homemade ice cream and this would send it over the top….yum. Wow negative nellies, get a life! The recipe isn't about a cocktail, its a sauce and the alcohol cooks out. So use whatever you have, bourbon or whiskey. I've made a similar sauce and its amazing with chocolate cake too. MommyTanya: Vanilla bean paste will also work in the same way as the vanilla bean seeds. Enjoy! Do you know how long this will keep in the fridge in a closed container? Shanna: This will keep in the fridge for several months. Anonymous: No one is being negative…people are posting informative comments. I, for one, am learning something. does this sauce harden in the fridge? Anonymous: This caramel sauce will thicken in the fridge but not harden. If I want to drizzle it on something, I like to bring it up to room temperature first and if I want it more syrup-y I give it 20 seconds in the microwave. how does simple syrup turn amber? mine never did. Anonymous: After simmering for the 15-20 minutes the water should have completely cooked off and the melted sugar should turn a nice amber colour. Really the water is just there to help the sugar melt uniformly and you can omit it completely and speed things up. does someone know how long this would hold if I put it in a jar? Anonymous: This will keep for months in a jar in the fridge.